For other uses, see Stranger in Town (disambiguation). Stranger in Town is the tenth studio album by American rock singer Bob Seger and his second with the Silver Bullet Band, released by Capitol Records in May 1978 (see 1978 in music). Like its predecessor, the Silver Bullet Band backed Seger on about half of the songs and the Muscle Shoals Rhythm Section backed Seger on the other half. The album became an instant success in the United States, being certified platinum by the Recording Industry Association of America less than a month after the album's release, and, like its predecessor Night Moves, it would later go six times platinum. It was also his first album to chart in the UK, where limited editions were released on silver vinyl and in picture disc format as well as standard black vinyl. Glenn Frey - guitar solo on "Till It Shines"
Don Felder - guitar solo on "Ain't Got No Money"
Bill Payne - organ, synthesizer, piano, keyboards on "Hollywood Nights"
Doug Riley - piano, keyboard on "Feel Like a Number" and "Brave Strangers"
"We've Got Tonite" and "Still the Same"
"Still the Same" and "Brave Strangers"
↑ Erlewine, Stephen Thomas. Bob Seger & the Silver Bullet Band: Stranger in Town > Review at AllMusic. Retrieved 4 July 2011. ↑ Christgau, Robert (June 26, 1978). "Christgau's Consumer Guide". The Village Voice. New York. Retrieved September 19, 2015. 1 2 "Gold & Platinum Searchable Database" (PHP). Recording Industry Association of America. ↑ "Le Détail des Albums de chaque Artiste (S)" (PHP). InfoDisc (in French). Search for "Bob SEGER & The SILVER BULLET Band" on the drop-down menu to see results. 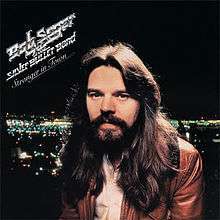 ↑ "Album – Bob Seger & the Silver Bullet Band, Stranger in Town" (ASP). Media Control Charts (in German). Retrieved July 5, 2011. ↑ "Bob Seger & the Silver Bullet Band – Stranger in Town (Album)" (ASP). Swedish Charts. Hung Medien. Retrieved July 5, 2011. ↑ "Chart Archive: Top 40 Official UK Albums Archive – 3rd June 1978". The Official Charts Company. Retrieved July 5, 2011. ↑ "Bob Seger: Charts & Awards – Billboard Albums". Allmusic. Rovi Corporation. Retrieved July 5, 2011. ↑ "Bob Seger & the Silver Bullet Band – Stranger in Town (Album)" (ASP). New Zealand Charts. Hung Medien. Retrieved July 5, 2011. ↑ "Canadian album certifications – Bob Seger – Stranger in Town". Music Canada.